Helmets Required. And, for insurance purposes, so is SVBC membership after an initial guest ride. HELMETS ARE REQUIRED for all SVBC Rides! Description: Social intermediate mountain bike ride. Length: 1.5 – 2 hours. Location: Meet at the Massanutten Western Slope parking lot. MONDAYS: Post-kid bedtime night ride. ALL are welcome. Monday, 8:30pm…1-1 1/2 Road ride into Rockingham County. Length: 1-1 1/2 hour road ride with a little social time afterward and maybe a beverage. Pace: We usually average around 15 mph, the goal is to ride as a group and have fun. 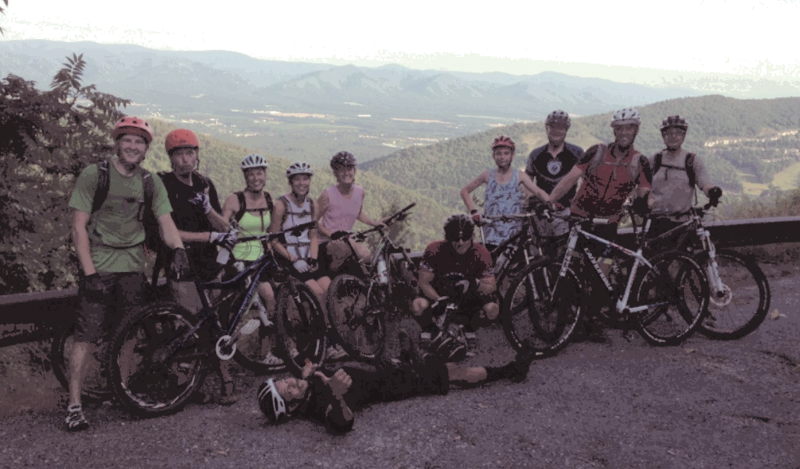 Description: This is a “drop” road ride, but you will often find the group waiting up for some folks as the terrain and flow of the ride permits. However, there is no guarantee that the group will wait for you if you fall off the back. Generally, the group does not lose more than 25% of riders. Pace: The ride averages close to 20mph, sometimes less depending on the hills. Location: Meet at Shenandoah Bicycle Company. Description: Group bike ride for the ladies. Description: This is an intermediate, social road ride. Pace: Pace is “social,” 12 – 14 mph, with no one dropped. Length: Between 20 and 30 miles, or 1.5-2 hours. Location: Meet at Harrisonburg High S on 1001 Garbers Church Road. Description: Women’s ride, ALL levels welcome. No drops, no apologies! Pace: Short loop is relaxed pace with pauses to regroup. Longer ride is 12-14 mph, social. Length: Short loop 9 miles; longer ride 20-25 miles. Questions: Please email [email protected]. Description: Weekly trail work building and maintaining the trails at Massanutten Western Slope. What to Bring: Bring gloves and good trail work attire. The Coalition will supply tools and drinks. Location: We will work on the newest trail up top, “The Puzzler” Parking will be at the bottom of the 2K trail. Park on the same side of the road as all the other cars. Trail Work Leader Contact Information: Thomas, [email protected] or 540-236-2001. Description: This is a group ride of about 30 miles with an average speed of 17-18mph. This is not a no-drop ride, so it is helpful to know your way back if you fall off the pace. Multiple Routes and riders should be prepared to ride on dirt roads. Location: Meet at Rocktown Bicycles. Length: 3-4 hour ride on backcountry trails of intermediate to advanced terrain. Expect 30-45 minutes drive time each way to/from the ride’s start. Location: Varies each week. We’ll try to make the selection by Thursday every week, but the location is subject to change at the last minute to accommodate current weather and trail conditions. Logistics: Leave (drive/carpool) from Shenandoah Bicycle Company. For those catching a lift with others to/from the ride’s start, leave your car in the municipal lot (free parking) by the Turner Pavilion. Then just walk over to SBC with your bike and gear, and we’ll load up there. Sunday Bridgewater Road Ride, April 21- Ride beginning at 9 AM. Riding wider tire bikes on mixed surface roads. Description: Social intermediate road ride. No one is dropped. This is a ride for those that can ride at an intermediate pace. 40-50 miles in warm weather. 20-30 miles in cold weather. Check this webpage each Saturday for weekly for updates. Pace: Faster than Wednesday’s social ride and slower than Thursday’s steady ride. Location: Leaves from Bridgewater’s Wildwood Park, West Bank St.
Sunday Harrisonburg Road Ride. April 14: we will be joining the annual Harris-Roubaix ride this week. Meet at 745 South Dogwood Dr. at 11:30 AM, or at Court Square in Harrisonburg in time for a 12 Noon start. Description: Casual road ride, Sundays throughout the year. Check this webpage each Saturday for weekly updates. Pace: Casual-pace; nobody gets dropped. Length: Usually 20-40 miles; occasionally more. Ride Leader Contact Information: Carl Droms, dromscg (at) gmail (dot) com or 540-908-7806. 4/24/17 News Leader Community Events said there is a 10am 4/29/17 ride starting from Stable Craft Brewery but there is no mention of this above….is this Saturday ride still on? A “senior” rider new to single track looking for fellow rider to explore novice/intermediate trails on the eastern side of the valley, such as Shenandoah River Park in Bentonville. Richard, Most of our members are riding in the Shenandoah Valley. You can post in our Facebook group looking for riding partners:https://www.facebook.com/groups/SVBCoalition/ there is also a Facebook group for folks located further north: http://www.facebook.com/groups/367390340275389/ Good luck!